Graham with Mont Blanc in the background, 2016. One of the genuine highlights of the Shelley Conference 2017 was a dynamic presentation by University of Leeds scholar Carl McKeating: "A City of Death: The Shelleys and Mont Blanc." Taking Mary and Percy’s History of a Six Weeks Tour as his focus, McKeating explores what was for me an exciting but hitherto poorly understood aspect of the book: the extent to which Mary’s and Percy’s perceptions of Mont Blanc were influenced and even conditioned by the tour guides they employed. I feel my research benefits from the insight offered by a climbing and mountaineering background. I have had a varied career that for the most part has prioritised spending time in mountain ranges. Nonetheless, I momentarily settled down to teach and left my most recent post as a secondary English teacher to commence the PhD at Leeds. I studied at Lancaster University for my undergraduate degree, where the tutorship of the poet Paul Farley was an inspiration for future academic and creative writing. But before getting to McKeating's great talk (included in audio-visual below), I wanted set the scene a little and share some of my own experiences with a mountain that in some ways can feel a bit anti-climactic after having read all the great literature about it. So, buckle up: we're headed to the Alps! Mont Blanc seen from Geneva. Copyright Graham Henderson, 2016. View of Mont Blanc Massif, obscured by clouds. Copyright Graham Henderson, 2016. If you travel to Mont Blanc today, you will have a very different experience from that of the Shelleys, who described the famous Swiss mountain as sublime and infused with supernatural terrors. 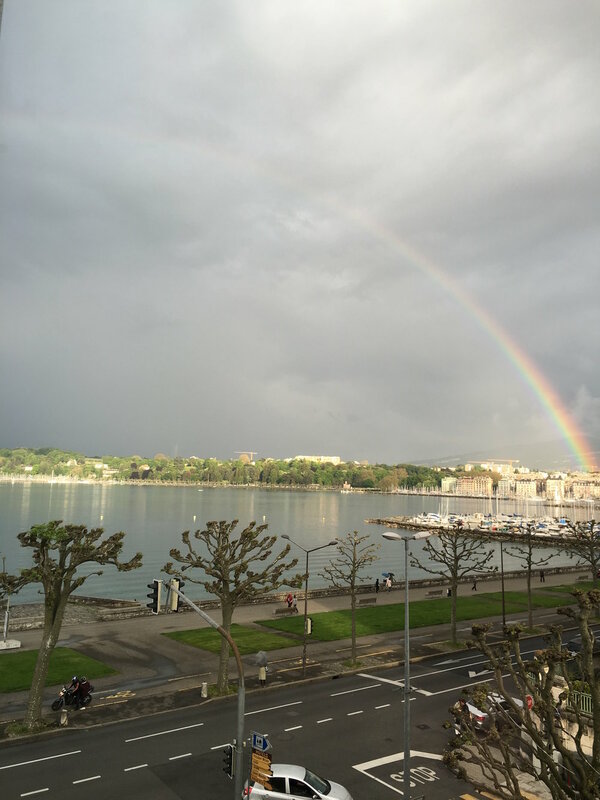 Today, you can leave Geneva on a modern superhighway and be in your hotel room in just over an hour. Mary and Percy's journey required almost three days on horseback. "They were no more than mountain rivulets, but the height from which they fell, at least of twelve hundred feet, made them assume a character inconsistent with the smallness of their stream. The first [i.e. the Arpenaz waterfall] fell from the overhanging brow of a black precipice on an enormous rock, precisely resembling some colossal Egyptian deity. It struck the head of the visionary image, and gracefully dividing there, fell from it in folds of foam more like to cloud than water, imitating a veil of the most exquisite woof. It then united, concealing the lower part of the statue, and hiding itself in a winding of its channel, burst into a deeper fall, and crossed our route in its path towards the Arve." Gabriel Charton, "Servox". From Souvenirs Pittoresques des Glaciers de Chamouny, 1821; reprinted by Tony Astil, 2015. The church is still there. "As we proceeded, our route still lay through the valley, or rather, as it had now become, the vast ravine, which is at once the couch and the creation of the terrible Arve. We ascended, winding between mountains whose immensity staggers the imagination. We crossed the path of a torrent, which three days since had descended from the thawing snow, and torn the road away... From Servoz three leagues remain to Chamouni.—Mont Blanc was before us—the Alps, with their innumerable glaciers on high all around, closing in the complicated windings of the single vale—forests inexpressibly beautiful, but majestic in their beauty—intermingled beech and pine, and oak, overshadowed our road, or receded, whilst lawns of such verdure as I have never seen before occupied these openings, and gradually became darker in their recesses. Mont Blanc was before us, but it was covered with cloud; its base, furrowed with dreadful gaps, was seen above. Pinnacles of snow intolerably bright, part of the chain connected with Mont Blanc, shone through the clouds at intervals on high. I never knew—I never imagined what mountains were before. The immensity of these aerial summits excited, when they suddenly burst upon the sight, a sentiment of extatic wonder, not unallied to madness. And remember this was all one scene, it all pressed home to our regard and our imagination. Though it embraced a vast extent of space, the snowy pyramids which shot into the bright blue sky seemed to overhang our path; the ravine, clothed with gigantic pines, and black with its depth below, so deep that the very roaring of the untameable Arve, which rolled through it, could not be heard above—all was as much our own, as if we had been the creators of such impressions in the minds of others as now occupied our own. Nature was the poet, whose harmony held our spirits more breathless than that of the divinest." 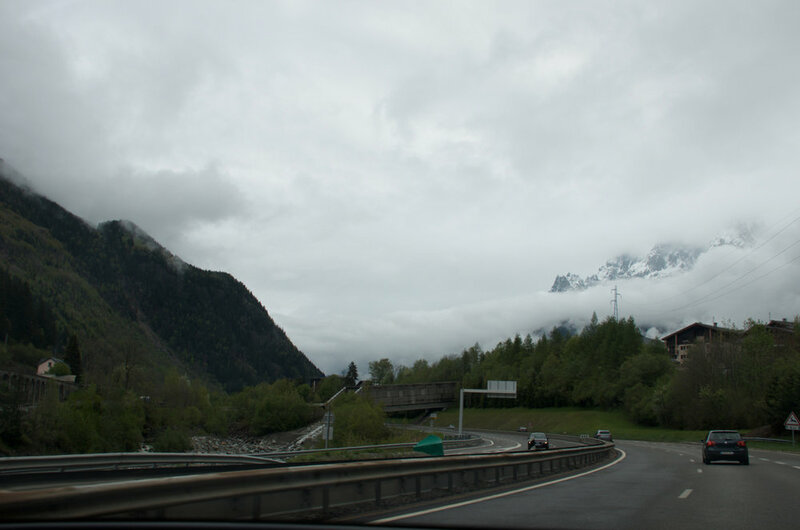 When I arrived in the valley, I encountered the same problem that bedeviled the Shelleys -- Mont Blanc was shrouded with clouds. The Vale of Chamonix, 2016. Copyright Henderson. Mont Blanc is not even in the picture; it is off to the right. In the foreground, you can see the Glacier des Bossons. Just beyond it lies the spire of the church in Chamonix and then the terminus of the Mer de Glace, which you can see actually encroaches on the valley floor itself. Today these glaciers have long since receded into the mountains. Mont Blanc Massif from Chamonix. Copyright Henderson, 2016. North Face of Mount Everest from Rongbuk. Copyright Henderson, 1994. There is no doubt that the Shelleys’ minds would have been very much more impressionable than ours are today – and less inured to wild landscapes. They had never actually seen real mountains. Very few travel guides existed that could prepare you for what you were about to see. As I mentioned before, in the 1810s, the Mont Blanc glaciers actually spilled out onto the valley and were menacingly advancing (for an idea of how this might have looked to the Shelleys, see the image below). The Shelleys were also fresh from their stay at the Villa Diodati where they had engaged in a ghost-story competition! Then there was the outlandish weather that was the hallmark of the “Year Without Summer”. All of this may well have perhaps primed then for, shall we say, a heightened experience. Gabriel Charton, "La Source de l'Arvenon". From Souvenirs Pittoresques des Glaciers de Chamouny, 1821; reprinted by Tony Astil, 2015. The glacier can not even be seen from Montanvert. It is around the corner having retreated 10 miles thanks to climate change- why am I smiling!? Copyright Henderson, 2016. This leaves us with an obvious dilemma: if the mountain is somewhat unremarkable, why do the Shelleys write about it as if it were the most imposing, threatening presence in the Alps? This is where Carl McKeating picks up the story, for as he tells us, there was another factor which led to the Shelley’s highly emotional response to what they saw: they were powerfully influenced by their tour guides. As McKeating points out, critics have rarely viewed the Shelleys as tourists, but this is exactly what they were. In fact, in several instances, Percy bluntly complains about the presence of other tourists – demonstrating that the more things change, the more they stay the same! Both Mary and Percy frame Mont Blanc as a place where supernatural forces lurked and where death was imminent. References to Mont Blanc as the abode of witches appears in Byron’s Manfred, Mary’s Frankenstein and Percy’s "Mont Blanc." Percy at one point records witnessing an avalanche -- in July 1816. McKeating speculates on the role the guides might have played at such a moment. While their duty was to keep the guests safe, they also wanted to take tourists to the most exciting places – places which also might involve an experience of danger. McKeating is also one of the most entertaining presenters I have ever seen inside or outside of the academy. You will thank me if you take my advice and spend 20 minutes with him while he spins his own tale of mystery, intrigue, witches......and the palace of death!!! 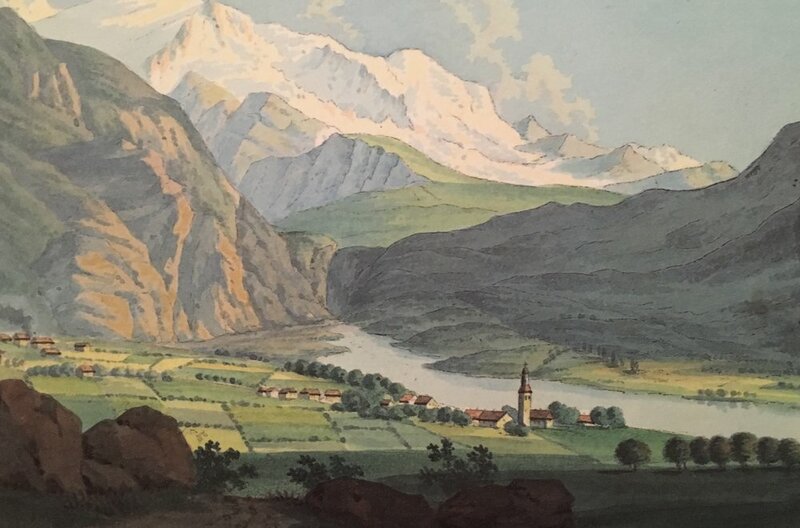 Mont Blanc was a towering presence in the imaginative geography of British eighteenth and early nineteenth century writing, featuring in poetry, fiction, travel literature, and natural philosophy. My work uses a broadly chronological and geocritical approach to investigate the cultural prominence of Western Europe's highest mountain. The period of my study addresses the 'discovery' of Mont Blanc by William Windham's party of 'Eight Englishmen' in 1741, Mont Blanc's first ascent by the Horace Benedict de Saussure-sponsored Paccard and Balmat in 1786, and the mountain's literary blossoming during the Romantic period when it played a key role in the re-evaluation of mountain topography and the formation of identity for British writers including William Wordsworth, Helen Maria Williams, Mary Robinson, Samuel Taylor Coleridge, Mary Shelley, Lord Byron and Percy Bysshe Shelley.